are many deer and Wildlife in this area! First, here is a link to get directions from Google maps. (For Example: 123 Walnut Street, Bloomington IN). From Bloomington: Take South Rockport Road;(Go approximately 6.5 Miles) thru little town of Kirksville; Haunted Hayride and Stables is located on your right next to a little white church and across from a cemetery on left. (Due to I-69 construction, access to S. Rockport Rd from SR 37 has detours). 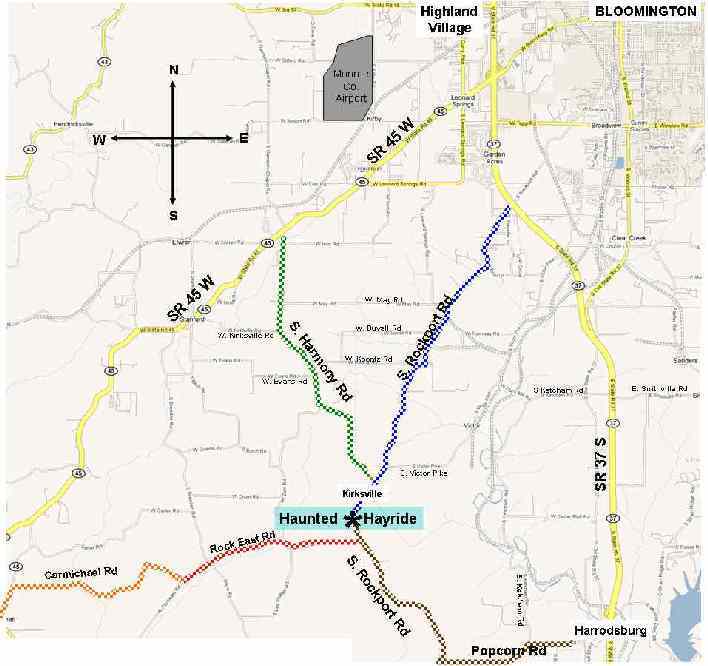 From Harrodsburg: From Harrodsburg Road; Take West Popcorn Road (approximately 2.7 miles); Turn Right on South Rockport Road (approximately 3.2 miles); Haunted Hayride and Stables is located on your left next to a little white church and across from a cemetery on your right. From SR 45 W: Due to I-69 Construction, From SR45W; Take South Harmony Road (approximately 2.3 miles); If Harmony Rd is closed, Turn left on W. Koontz Rd and follow to South Rockport Road. At Rockport Rd, turn right (approximately 2.5 mile) thru little town of Kirksville; Haunted Hayride and Stables is located on your right next to a little white church and across from a cemetery on your left. If S. Harmony Road is open, just follow S. Harmony Rd to S. Rockport Rd and turn right; (Haunted Hayride and Stable is thru little town of Kirksville located on your right next to a little white church and across from a cemetery on your left). From Little Cincinatti, IN & SR45: Take Carmichael Road (or CR35N); Turn left on West Rock East Road; Turn left on South Rockport Road; Haunted Hayride and Stables is located on your left next to a little white church and across from a cemetery on your right.